Polaris RZR XP1000 Cab Back Fits: 2014-2016 RZR XP1K (1000) and XP1K-4 (1000 four seat) Will also fit the Turbo Model. 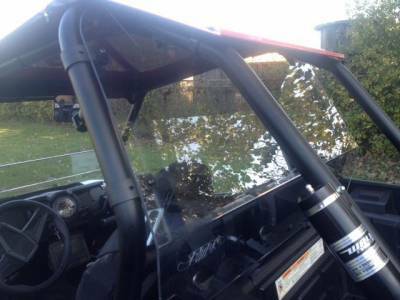 will not fit the RZR-S 1000, see P/N: 12696. Protects your back side from rain and snow. Works great for keeping dust out of the passenger area. If you have a full windshield and drive on a lot of dusty roads this is a must. Made from 3/16" thick Polycarbonate, which is much more scratch resistant that the acrylic cab backs on the market. Polycarbonate is virtually unbreakable, and there is a demonstration video posted below. Attaches with EMP Fast Straps, which will not rust, rattle, or leave marks on your cage. The Fast Straps allow you to remove the cab back quickly, and make the reinstall very simple without tools. The cab back has spacers so that it is not sitting directly against the cage, and it will still work with harnesses. EMP Logo is etched into the lower area of the plastic. Ships Via UPS or Fed Ex ground. Made in the USA.